Amazon’s Echo Dot, believe it or not, is in its third generation. It’s been a whirlwind few years for Amazon and its smart devices, as well as for its smart assistant. With the proliferation of Alexa in all kinds of devices, support has pushed the assistant to grow increasingly self-sufficient, lessening the need for additional hubs with Echo devices. 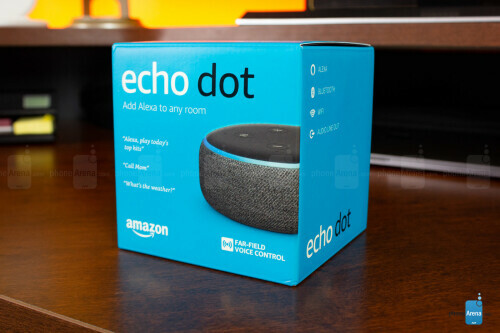 So, by its third generation, is the Echo Dot truly all you need? Amazon’s latest Echo Dot – as one might guess, even just by the name – is a simple and small device, but it has made some much-needed aesthetic and functional upgrades over its predecessor. 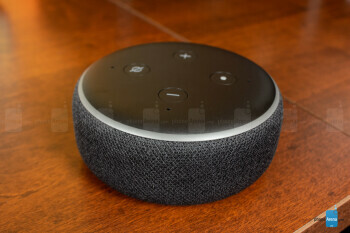 Trading the shiny plastic body of yesteryear for mélange, woven fabric wrapped around the entire device, the third-generation Echo Dot finally looks more like a small speaker and less like a smart hockey puck. It’s also a bit rounder and ever-so bulkier, altogether creating a look that distinguishes itself as understated home décor much better than it did in previous years. Internally, you’ll find a four-mic array, down from the second-gen’s seven, and a slightly bigger 1.6-inch speaker, up from 1.1. The down-size in mic quantity, thankfully, has no ill effects on hot-word detection – even when music is playing at top volume – and the speaker upgrade is an appreciable one which we’ll look at in more depth in a bit. In terms of ports, you’ll still find a 3.5mm headphone jack for wiring the Echo Dot to external speakers, but instead of a microUSB power port, we have one of a proprietary kind. 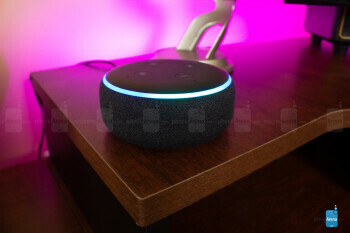 The Alexa assistant is the Echo Dot’s main source of functionality, and while it has improved some over the years, it still has a lot of ground to make up between it and the Google Assistant. The Google Assistant remains more effortless in its ability to follow lines of questioning; it can generally answer more questions and do so more accurately. Alexa’s list of compatible apps and devices is constantly growing, but it seems its research skills haven’t kept nearly the same pace. As Amazon has done from the launch of Alexa and its Echo devices, the company leads the way in smart home compatibility and app integrations – otherwise known as Alexa skills – compared to other smart speakers. 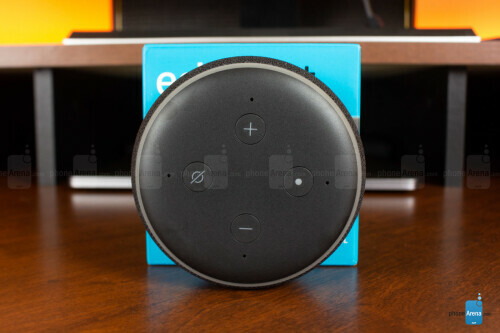 Harboring an arsenal of over 50,000 skills and 20,000 Alexa-compatible devices, your Echo Dot doesn’t need (or have) a screen, a Zigbee smart home hub, or a multi-speaker array within – but it can still show you your front door (via a camera-enabled Ring device and a Fire TV product), turn on the lights (with a compatible smart plug or smart light), or even play music to your favorite Bluetooth or 3.5mm-jack-toting speaker. 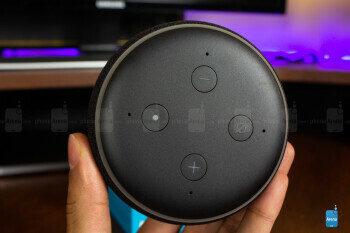 As far as on-device functionality goes, you have the same four buttons as on previous Echo Dots: volume up, volume down, mic on/off, and the “action” button. They all do as you’d expect without issue, while the action button offers a handful of functions, including the ability to silence alarms, put the device into setup mode, and call up the Alexa voice assistant. All other functions not related to querying Alexa, such as initial setup, music playback, and smart home setup, are found in the Alexa App. The Alexa companion app has also advanced slightly, but well. Here you’ll find tabs for your “Home” screen, which shows the weather, news stories, and skill advertisements among other interactive cards; Communicate, where you can make calls, send texts, and drop in to other Echo devices in your network; Play, which affords controls for playback from podcasts, internet radio, and music streaming services, which, as of very recently, includes Apple Music support, covering most major streaming platforms; and finally the Devices tab where all smart device setup and control takes place. All the tabs are easy enough to sort through, and offer functions in a straightforward, well-organized fashion. Swipe from the side or hit the menu icon to jump to settings, skills, routines, and a few other functions not belonging to one of the four tabs. There are no settings menus inside of settings menus or labyrinthine folder structures – something the Google Home app couldn’t hurt to learn from. Amazon doesn’t specify which Bluetooth version is packed within the third-generation Echo Dot, but regardless, we’re glad to have it. 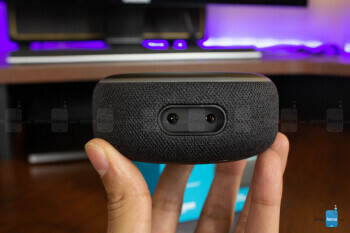 We had no issues walking around, playing music from our phones to the Dot and you won’t find any issue with its connection to Bluetooth speakers either – both are quick, easy, and reliable. Of course, we’re also quite thankful to still have the option to hardwire a speaker to the Echo Dot. Dual-band Wi-Fi is also on board to take advantage of faster Wi-Fi on the 5 GHz network if available. 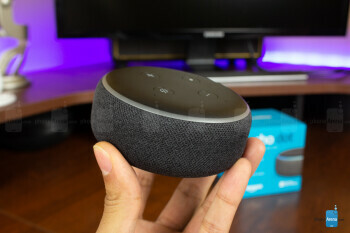 Being a single-speaker device, the third-gen Echo Dot won’t blow anyone away with its loudness or depth, but we were quite impressed with the improvement in these particular areas compared to its tinny, anemic predecessor. Compared to this, and even the Google Home Mini, this Echo Dot has audio that’s fuller, louder, and clearer. Listening to music on this is a surprisingly tolerable experience – even at top volume, though it wouldn’t be our first choice. You’ll have no problem hearing Alexa loud and clear from across the room, and even with the music turned up, she seems to have little issue hearing you as well. 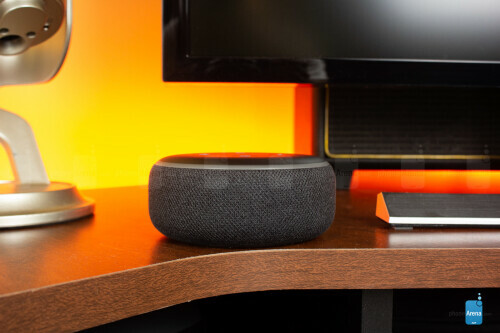 Luckily, the Echo Dot has a 3.5mm jack and Bluetooth connectivity to step up the musical experience, but it can only join in a multiroom audio setup with other Echo devices; Alexa-enabled speakers without the Echo brand can’t be added to groups as Google Assistant-enabled speakers can with Google Home devices. That’s a bit of a bummer for this, and all Alexa speakers, but as far as the Echo Dot’s speaker goes, put simply, it’s one of the best you’ll find at this size – smart speaker or not. Amazon’s Echo Dot doesn’t need to be more than it is. 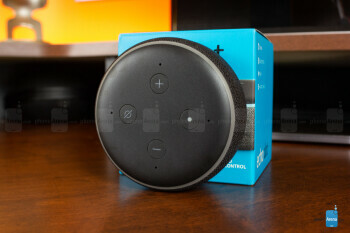 Having Amazon’s wide breadth of compatible devices and the proper tools for connectivity to satisfy most smart home users, the $50 (currently, and frequently, selling for $30 and less) Echo Dot is mostly a housing unit for its Alexa assistant and the many integrations that come with it. On the side, it’s a streaming device and a Bluetooth speaker, too. 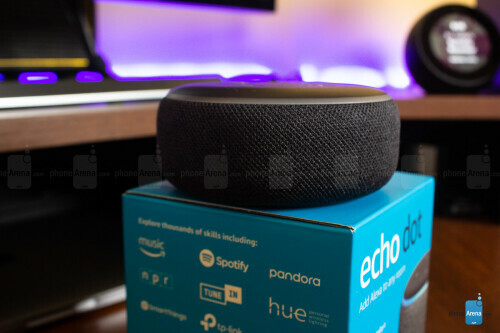 Making the Echo Dot a speaker that people could actually be satisfied listening to music on is truly just a bit of icing on the cake. Is Alexa a perfect assistant? Far from it. But if having a smart home, rather than a smart assistant, is your goal then the third-generation Echo Dot is almost certainly just what you need. That is, unless you already have a Google-run smart home, of course. In that case, there’s not yet any reason compelling enough to switch.